Crohn’s disease is a serious autoimmune condition that affects many parts of our digestive tract. Diet can play an important part in developing and alleviating symptoms. Listen in to find out how. 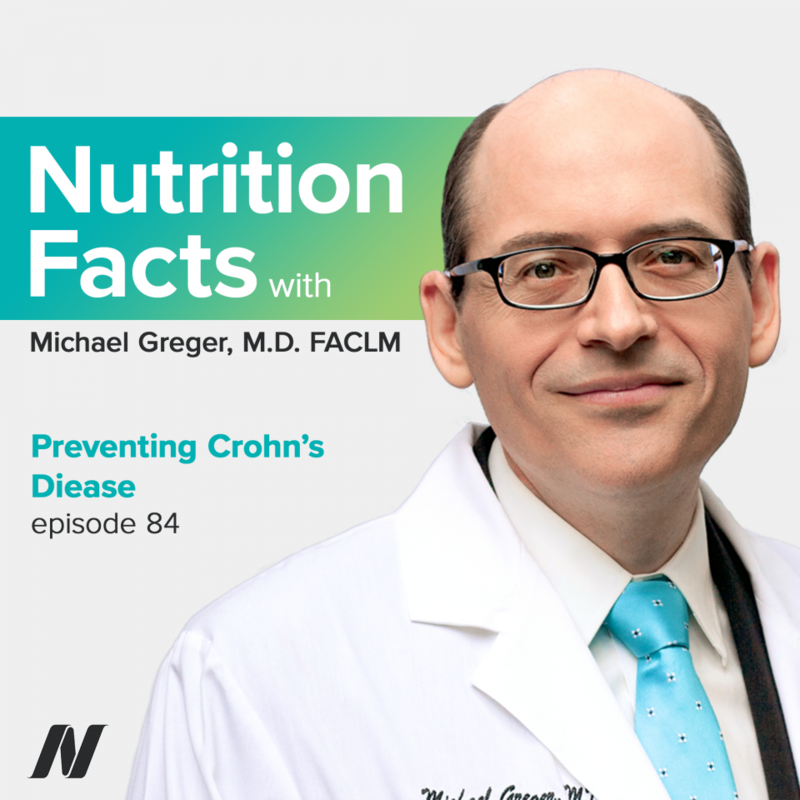 This episode features audio from Preventing Crohn’s Disease with Diet, Does Nutritional Yeast Trigger Crohn’s Disease?, and Vitamin D for Inflammatory Bowel Disease. Visit the video pages for all sources and doctor’s notes related to this podcast. Hello and welcome to the Nutrition Facts podcast. I’m your host, Dr. Michael Greger. Now, I know I’m known for explaining how not to do certain things (just look at my books, How Not to Die, the one I’m working on right now–How Not to Diet), but what I actually have to share with you is quite positive and boils down to this: What’s the best way to live a healthy life? Here are some answers. Today, we’re going to talk about how our diet affects Crohn’s disease – an autoimmune disorder that can affect many parts of our digestive tract. Diets centered around whole plant foods may help prevent Crohn’s disease thanks to the role of fiber on the maintenance of intestinal barrier function and the avoidance of certain processed food additives such as polysorbate 80. Here’s the story. Crohn’s disease is an autoimmune disorder that affects more than a million Americans, an inflammatory bowel disease in which your body attacks your own intestines. There is currently no cure for Crohn’s disease and current research focuses on just controlling symptoms. There is no definitive medical or surgical therapy. In fact, the best we have is a more plant-based diet, which has afforded the best result in relapse prevention to date. They got the idea to try it because diets rich in animal protein and animal fat have been found to cause a decrease in beneficial bacteria in the intestine, and so they designed this semi-vegetarian diet to counter that, and 100% stayed in remission the first year and 92% the second year. These results are far better than those obtained by current drugs, including these new so-called biological agents that can cost $40,000 a year, and cause side effects like progressive multifocal leukoencephalopathy, a disabling and deadly brain disease, whereas the diet doesn’t cost $40K, and the worst that can happen is maybe get greens stuck in your teeth or something, and diet appears to work better. What about preventing Crohn’s disease in the first place? Well, a systematic review of the scientific literature on dietary intake and the risk of developing inflammatory bowel disease found that high intakes of fats and meat was associated with an increased risk of Crohn’s disease, as well as ulcerative colitis, whereas high fiber and fruit intakes were associated with decreased risk of Crohn’s. This was supported more recently by the Harvard Nurses’ Health Study. Three million person-years of data revealed that long-term intake of dietary fiber, particularly from fruit, was associated with lower risk of Crohn’s disease. Women who fell into the highest long-term fiber consumption group had a 40% reduced risk leading the accompanying editorial to conclude that “Advocating for a high-fiber diet may ultimately reduce the incidence of Crohn’s disease.” The irony is that the highest fiber group wasn’t even reaching the official recommended daily minimum of fiber intake, but even just being less fiber deficient has a wide range of benefits, including, evidently, a significant reduction in risk of developing Crohn’s disease. But why? The authors suggest it’s because fiber appears to play a vital role in the maintenance of our intestinal barrier function. Our skin keeps the outside world out, and so does the lining of our gut, but in Crohn’s disease this barrier function is impaired. The thought is that the increase in prevalence of inflammatory bowel diseases may be that dietary changes lead to the breakdown of our intestinal barrier, potentially allowing the penetration of bacteria into our gut wall, which our body then attacks, triggering the inflammation. We know fiber acts as a prebiotic in our colon, the large intestine, feeding our good bacteria, but what does fiber do in our small intestine, where Crohn’s often starts? We didn’t know, until this landmark study was published. They wanted to find out what could stop this Crohn’s-associated invasive bacteria from tunneling into the gut wall. They found that the invasion is inhibited by the presence of certain soluble plant fibers, such as from plantains and broccoli, at the kinds of concentrations one might expect from just eating them. They wonder if that may explain why plantain-loving populations have lower levels of inflammatory bowel disease. They also found that there was something found in processed foods that facilitated the invasion of the bacteria: polysorbate 80, found predominantly in ice cream, but also found in Crisco, Cool Whip, condiments, cottage cheese—you just have to read the labels. What about maltodextrin? Found in artificial sweeteners like Splenda, snack foods, salad dressings, and fiber supplements. Maltodextrin markedly enhanced the ability of the bacteria to glom onto our intestinal cells, though other additives, carboxymethyl cellulose and xanthan gum appeared to have no adverse effects. This may all help solve the mystery of why the increasing prevalence of Crohn’s disease in developed nations, where we’re eating less fiber-containing whole plant foods and more processed foods. What we need now are interventional studies to see if boosting fiber intake and avoiding these food additives can be effective in preventing and treating Crohn’s disease. But until then, what do we tell people? Well, the available evidence points to a diet low in animal fat, with lots of soluble fiber-containing plant foods, and avoiding processed fatty foods that contain these emulsifiers, as well as making sure we’re not ingesting traces of dishwashing detergent, which could have the same effect, by just rinsing dishes well. They found that some people wash dishes and then just leave them to dry without rinsing, which is probably not a good idea. Now do we have studies that show that avoiding polysorbate 80 and rinsing dishes well actually helps? No. Nevertheless, advice based on “best available evidence” is better than no advice at all. Is the exaggerated reaction of many Crohn’s disease patients to baker’s, brewer’s, and nutritional yeast just a consequence of their inflamed leaky gut, or might it be a contributing cause? Here’s the research. “Baker’s yeast in Crohn’s disease—Can it kill you?” Well, that’s an inflammatory title (no pun intended). Crohn’s disease is an inflammatory bowel disease. Might baker’s yeast, which is the same yeast as brewer’s yeast, which is the same yeast as nutritional yeast, play a role in Crohn’s disease? It all started with this study published in 1988, showing that people with Crohn’s disease tend to have more antibodies to yeast than people without Crohn’s disease. Antibodies are like homing devices our immune system makes to attack foreign invaders. That’s one part of our immune system; another is cell-mediated immunity, where our white blood cells attack invaders directly. And, the same hypersensitive reaction to yeast was found in the white blood cells of Crohn’s disease patients, as well. If you draw blood from healthy people, even bakers who are around yeast all the time, and you expose their peripheral blood leukocytes, their immune system white blood cells, to yeast, nothing happens. They just kind of ignore it, because it’s typically harmless. But, do the same thing with Crohn’s disease patients, and their white blood cells go crazy. Now, when I say typically harmless, if you have cancer, or AIDS, or are immunocompromised, you could potentially get infected from like, home-brewed beer, or probiotic yeast supplements, but they don’t think the yeast is actually infecting Crohn’s patients. People with Crohn’s may just be hypersensitive to exposure to the inactive, dead yeast in typical food products, which may help explain why, when you rest their bowels, when you make Crohn’s patients fast, they get better. In fact, that’s why we add yeast extracts and proteins to vaccines, as an adjuvant, an irritant like aluminum, to make the vaccines work better, by heightening the immune response. But, might that be raising the risk of autoimmune disease, boosting our immune response a little too much, especially in people who may be genetically susceptible, like with Crohn’s? So, how could we test it? Well, if anti-yeast antibodies are just a consequence of food particles leaking through the gut, Crohn’s patients should have antibodies to all sorts of common foods. But, no. Higher anti-yeast antibodies in Crohn’s disease compared to controls, but no greater reaction in Crohn’s patients to milk, wheat, or egg proteins, which would presumably all leak through, too. Or, you can look at it the other way; instead of other foods, what about other inflammatory bowel disorders—ulcerative colitis or acute gastroenteritis? There, you could get inflamed and leaky, too, yet no increased yeast reaction. So, there does appear to be something unique about the yeast-Crohn’s relationship. But, maybe inflamed Crohn’s intestines just uniquely and selectively allow yeast through? If you cut out the Crohn’s, can you stop the yeast reaction? Crohn’s gets so bad that most patients have to eventually go under the knife, and get sections of their intestines removed. So, when the inflamed segments are removed, does the yeast reaction go away? No; no change postop. So, a change in Crohn’s activity does not lead to a change in the yeast reaction. But, we still have to prove that the yeast reaction comes first. Thankfully, the Israeli military “systematically [draws blood] from [their] recruits,” follows their health for years; so, you can go back and check the blood of newly-diagnosed Crohn’s victims. And indeed, those who went on to have Crohn’s were years earlier disproportionately reacting to yeast. So, it’s not like yeast reactions were low until Crohn’s hit, and then they shot up; yeast reactivity crept up year after year, before the diagnosis. Now look, it’s possible that there was some subclinical gut leakiness in the years preceding diagnosis that led to the yeast reaction, but there doesn’t appear to be any association between yeast reactivity and gut leakiness. So: “Do high [blood] levels of [anti-yeast] antibodies result from a leakiness of the gut barrier in Crohn’s disease?” No; that does not appear to be the case. In our next story, Vitamin D supplements were put to the test for Crohn’s disease. “IBD is a chronic inflammatory condition of the intestine…that includes…Crohn’s disease and ulcerative colitis.” If you compare identical twins—even though they have the same genes—most of the time, if one twin has it, the other does not. So, there must be some important nongenetic “trigger factors.” What might they be? Why do those living in the southern United States have lower IBD rates than those living in the north? Maybe it’s because those living in the south get more sun, which means more vitamin D, which may mean less inflammation. So, do those with Crohn’s and ulcerative colitis with low vitamin D levels have worse disease? Apparently so; “increased risk of surgery and hospitalization,” and those that normalized their vitamin D levels appeared to reduce their risk of relapse. But, instead of better vitamin D leading to better Crohn’s, maybe the better Crohn’s led to better D; they felt so good, they went outside more. You can’t tell if it’s cause and effect, unless you put it to the test. The first pilot study tried 1,000 units of vitamin D a day, and saw no change in the Crohn’s disease activity index—though at six weeks, there may have been a slight increase in the inflammatory bowel disease quality-of-life scores. But, even that disappeared by year’s end. Pretty disappointing results. Maybe they didn’t use enough. How about 1,200 a day? The relapse rate appeared to be cut in half, though there were too few people in the study to reach statistical significance. How about 2,000 international units of vitamin D a day? Gut leakiness—so-called intestinal permeability—continued to worsen in the placebo group, but appeared to stabilize in the vitamin D group, though only those who reached blood levels over 75 nanomoles per liter appeared to have a significant drop in inflammation. And indeed, if you start Crohn’s patients on 1,000, and then ramp it up until they reach a target blood level, you can get a significant boost in quality of life, accompanying a significant drop in disease activity. Disease scores under 150 are considered remission. So, “the majority of patients achieved remission,” with improvements in disease activity, in “all but one patient.” This suggests that Crohn’s patients may want to take 5,000 international units of vitamin D a day. But, that’s nearly ten times the RDA. Why so much? Because that’s what it may take to get normal vitamin D levels—as in normal-for-our-species levels, the kind of levels one might get running around half-naked in Africa, as we did for millions of years. 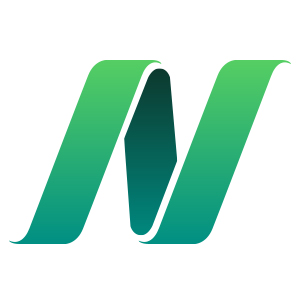 To see any graphs, charts, graphics, images or studies mentioned here, please go to the Nutrition Facts podcast landing page. There, you’ll find all the detailed information you need – plus links to all the sources we cite for each of these topics. Be sure to check out my new How Not to Die Cookbook. It’s beautifully designed, with more than 120 recipes for delicious, plant-based meals, snacks and beverages. All the proceeds from the sales of all my books all go to charity. I just want you to be healthier. Everything on the website is free. There’s no ads, no corporate sponsorship. It’s strictly non-commercial. I’m not selling anything. I just put it up as a public service, as a labor of love – as a tribute to my grandmother – whose own life was saved with evidence-based nutrition. This is just an approximation of the audio content, contributed by Allyson Burnett. My daughter loved fruits and veggies as a child, but developed Crohn’s in her mid 20’s and her trigger was salad, which makes her very unhappy. She did have 18 inches of intestine removed due to leaking fistula at the naval. The doctors just keep juggling medications which don’t seem too effective. My point in this backstory is that she seems in direct opposition to the facts stated in the Crohn’s info shared by Dr Greger. Plants give her horrendous, explosive diarrhea! I’m sorry to hear of your daughters experience. There are times that the higher fiber load will cause issues such as you describe, from their mechanical qualities especially when the gut flora is out of norm or if there is a trigger causing inflammation such as an allergen or if there is an issue with the tissue itself which can be caused by various genetic or other causes. It might be appropriate to try a small amount of well blended veggies in a soup or other mixture, one veggie at a time or to have her tested for allergens or consider the CDSA2 testing (www.gdx.net) to get a much more accurate read on her bowels function and contents. Don’t overlook digestive enzymes and other hidden issues contributing to her inflammation, from your/her environment. This is not a complete list, but areas that should not be overlooked to find the underlying cause. Please let us know your findings.